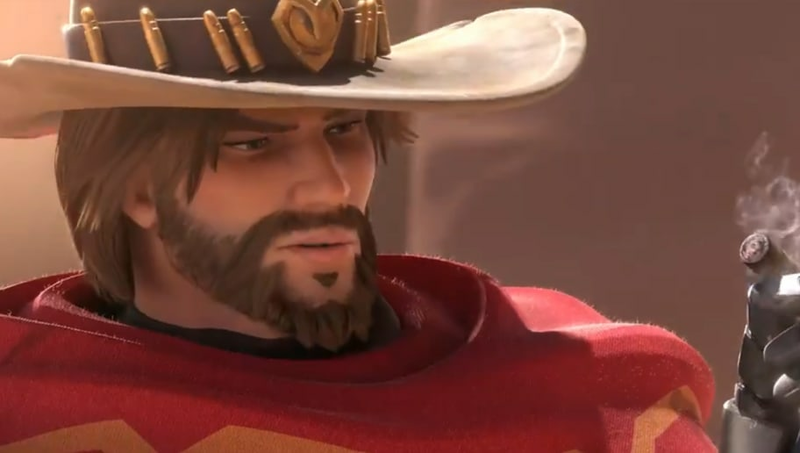 A McCree animated short, called "Reunion," was officially revealed Friday at BlizzCon. Overwatch hero McCree received his first animated short Friday with the "Reunion" short. The short began with the destruction of the train passing through Route 66. The Deadlock Gang, who McCree was formerly a part of before being picked up by Overwatch and Blackwatch, were stealing the contents of the train -- seen specifically taking the contents of the Route 66 payload. He confronts Ashe, who appears to be the leader of the Deadlock Gang. She refuses to hand the contents of the payload over and a fight breaks out before McCree successfully defeats the Deadlock gang. The container in the payload was revealed to contain an omnic inside, named Echo, who knows McCree. McCree tells her Overwatch, the organization, needs her. "Say hi to the monkey for me," McCree said before driving off. It was also revealed Ashe is Overwatch Hero 29. There are more panels that will focus on Overwatch and what Blizzard has in store for its future.